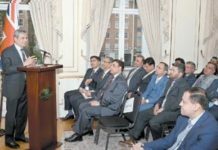 LONDON: Pakistan High Commissioner Mohammad Nafees Zakaria has said that by virtue of its geostrategic and geographic location, Pakistan is ideally situated to serve as a natural economic hub and energy corridor. In this regard, he mentionedCPECand Pakistan’s active participation, as a member at the ECO and CERAC as a manifestation. He stressed on the importance of investment to develop trade routesthatfacilitated transcontinental commercial activity. He express these views at a seminar organised by Andrew Bridgen MP, Chair of the All Party Parliamentary Group (APPG) on Uzbekistan. 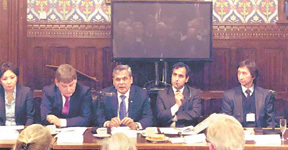 It was jointly chaired by Rehman Chishti MP, Chairman of Conservative Foreign and Commonwealth Council (CFCC) and Bota Hopkinson, Chair of Conservative Friends of Eurasia titled “The Seven Stans” on Global Britain and multilateral relations with the Stans i.e. Pakistan, Afghanistan, Kazakhstan, Kyrgyzstan, Tajikistan, Turkmenistan and Uzbekistan. Heads of Missions ofrespective countries and Parliamentarians linked to countries’APPGs attended the event. Mohammad Nafees Zakaria and other ambassadors were the panellists at the seminar. Nafees Zakaria shed light on the importance of connectivity in regional context and economic diplomacy as a foreign policy tool for promoting peace and stability in the region and beyond. 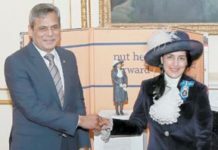 Nafees Zakaria said that by virtue of its geostrategic and geographic location, the HighCommissioner highlighted that Pakistan being at the confluence of South Asia, Central Asia, West Asia and Northwest China, was ideally situated to serve as a natural economic hub and energy corridor. In thisregard, he mentioned CPEC and Pakistan’s active participation, as a member at the ECO and CERAC as a manifestation. He stressed on the importance of investment to develop trade routes that facilitated transcontinental commercial activity. 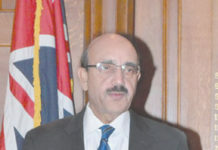 In this context, he remarked that Pakistan could serve as a bridge between theCommonwealth and the Economic Cooperation Organization (ECO) being a common member of both organizations. In order to attain the goal of economic prosperity for the people of the region, the Nafees Zakaria emphasized that the conflictssuch as Kashmir dispute need to be resolved.